Optimal support of production processes is a key demand to advanced plant technology: The sterilisation of stainless steel containers requires a more efficient workflow. Smart solutions are necessary to comply with individual conditions and spatial possibilities. Operators shall be able to flexibly sterilise several containers, either successively or simultaneously, at a favourable place. Automation has to usefully support the process flow. Grünewald Fruchtsaft GmbH processes large quantities of fruit to high-quality fresh goods and fruit products. These are aseptically filled into stainless steel containers and afterwards delivered to the downstream industries. Recently the sterilisation of these containers needed some upgrading. 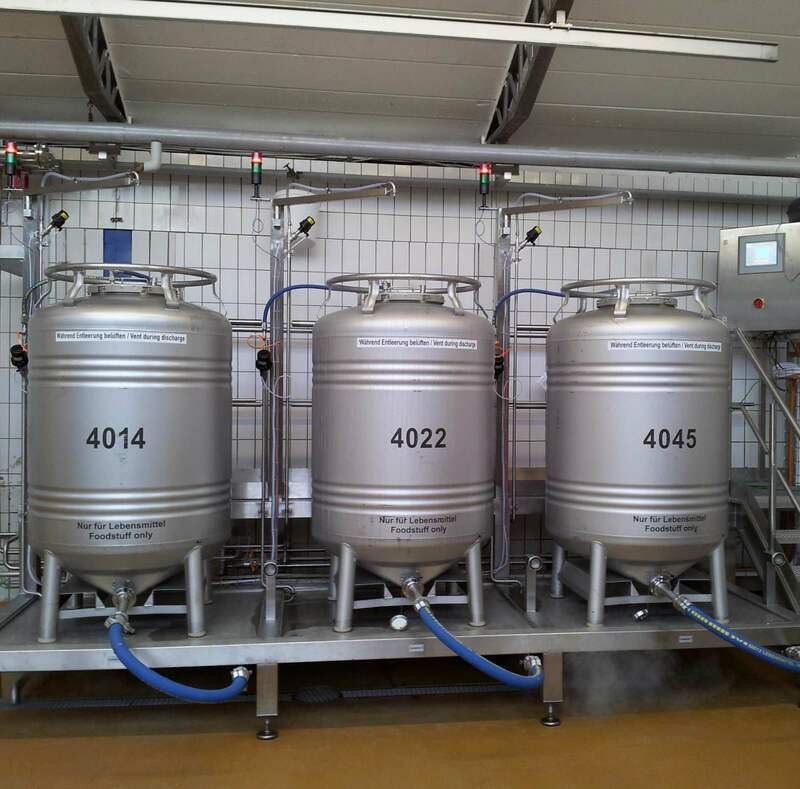 Aseptic safety and a high level of process traceability were self-evident basic requirements. Furthermore, Grünewald wanted to simplify procedures, increase the capacity and optimally exploit the available space. In close cooperation with Grünewald, Ruland worked out a concept, tailored to the customer’s specific needs, and realised a highly efficient container sterilisation in a very short space of time. The result is a central workplace where cleaned containers of different sizes can be inspected, serviced and assembled. Afterwards, they are immediately sterilised with hot steam. The design of both the working platform and the container area enables a fluent workflow in an ergonomic working position. Up to six containers may be connected and sterilised either successively or simultaneously. Every inch of the available space was optimally used for piping paths, operation and service areas and as reserve for manoeuvring. To integrate the sterilisation process into the superordinate data collection, Ruland programmed a bidirectional interface. Hereby, data collected by a scanner integrated into the ERP, like for example user name, container and parking space number, may directly be transferred to the control system or alternatively entered via touch panel by the operator. By this interface, process and batch data will be provided to the in-house data collection system. The operator provides a cleaned container on a parking space, checks and completes the container and connects it to the supply hoses. Then he scans container and parking space number or alternatively enters these data manually at the central touch panel of the station. After successful recording, switches for acknowledgement or release of the sterilisation will light up at the respective parking space. The containers are sterilised depending on the required sterilisation temperature and time. Afterwards, the steam will be forced out by means of sterile nitrogen and the container additionally sprinkled with water to accelerate the cooling phase. Once the container was successfully sterilised, the switches will start blinking. The operator closes the manual flap of the container and confirms action by pressing the switch or by acknowledgement at the touch panel, hereby depressurizing the supply hose. Prior to closing the manual flap and acknowledgement of this action, the target pressure of sterile containers will automatically be adjusted and checked. After removal of the media hoses, the container may be removed from the parking space and provided for filling with product. The parking space is then available for the next container. This unit seamlessly fits into the production process and enables an efficient and effective container sterilisation. It facilitates container handling for the operators and saves valuable production time. Learn more about container sterilisation.